This might be one of the simplest veggie side dishes I've made in a while, and it's a good one for garlic lovers. This recipe is a lightened version of an LA Times recipe that was adapted from Boon Eat + Drink in Guerneville, CA. 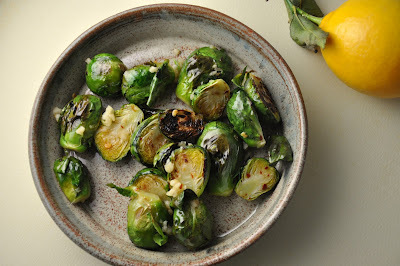 We eat at Boon just about every time we visit Guerneville (sometimes twice), but this last visit left us smitten with their delicious, yet somewhat deadly Brussels sprouts dish that does not skimp on the oil. They flash fry the Brussels sprouts, so the result is crispy on the outside, tender on the inside. The LA Times roasts them, but still manages to use a bit more oil than I like to use at home. This version is light, citrusy, and has a few crushed cloves of raw garlic to really make it pop. For those of you who have a cast iron skillet or baking pan, I highly recommend you use it for this dish. While you pre-heat the oven, try leaving the cast iron skillet in to get it nice and warm. Very little prep, and easy to execute, you can make it just about any night of the week. 1. Pre-heat oven to 475°. 2. Soak the sprouts in warm water for about 10 minutes to rid them of any unwanted guests. Trim the ends and slice in half. If you have a lot of different sizes, leave the smaller sprouts whole so they don't cook too fast. 3. Toss the Brussels sprouts with oil and salt, add to a roasting pan or cast iron pan if you have one. Roast on 475° for about 15 minutes, turning them every 3-4 minutes. They should emerge tender, and lightly crispy on the outside. 4. Transfer to a bowl containing the dressing ingredients and toss well until the sprouts are evenly coated and serve warm.